A few months after formally adopting Annie, she underwent a TPLO or a tibial-plateau-leveling osteotomy if you want to get technical. We still don’t know if the ruptured cruciate ligament that necessitated it was the result of her bolt into the blue on that fateful first day, or due to a more chronic degeneration. Either way, we had a very lame dog and two options, one of which was utterly unthinkable. After ruling out the local ‘specialist’ on the grounds that he had the bedside manner of a tree trunk, no apparent regard for an obviously terrified dog and some pretty outdated surgical methods, we booked an appointment with Noel Fitzpatrick. That his first greeting was to Annie and not us was earned him point one. That half the consultation was done with him sitting on the floor with a handful of dog biscuits earned him a stack more. A TPLO, although now routine, has a pretty lengthy recovery period. After all, it entails cutting away a chunk of the tibia to prevent the femur sliding down it when the dog puts weight on its knee. So darling Annie had six weeks crate rest, which for a young and active dog is pretty hard going. It was far from easy for us too as she woke us every three hours during the night because she was hurting, or because she had an itch she couldn’t scratch or was downright miserable. But we got through it because in our book, there just was no alternative. Months later, with the crate returned and the buster collar consigned to the loft we were woken in the night by the most terrible howling. The emergency vet diagnosed a fit and it wasn’t until later that day that we spotted the real cause of her distress, a small deep wound on her inner thigh. 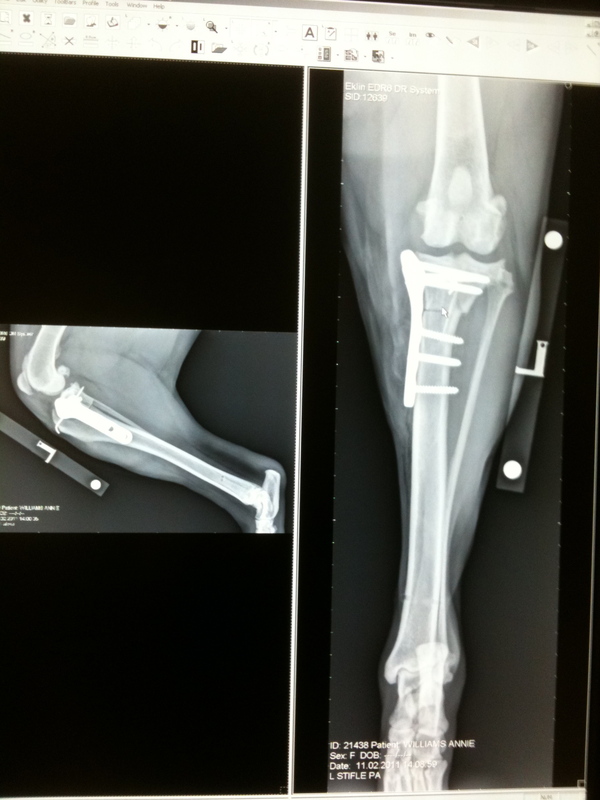 Somehow, Annie had punctured the muscle around the metal plate that was holding her leg together. The pain must have been unbearable for this stoical little dog to be so consumed by it. The wound healed and then a few weeks later opened up again. For months we agonised over whether to take the now redundant plate out. Although the surgeon confirmed that she no longer needed it, we were concerned about yet another anaesthetic. Months went by with not a single incident and we started to relax and think that finally the area had built up enough scar tissue to protect the skin from knocks. But then, out of the blue it opened up again, but in two places this time. They were small, superficial wounds and aside from licking them, they didn’t seem to bother her, but they certainly bothered us. Leaving a dog at the vets for an operation is never much fun. Leaving a dog so nervous she’s shaking from temple to tail is no fun at all. So imagine the fury when we get a call from the vet to say that after opening her up, he was unable to take the plate out because the original surgeon put two different types of screw into the leg but only told him about one. Poor Annie was stitched up and sent home only to have to return two days later to have it done all over again, but this time with the benefit of two specialist screwdriver heads instead of the one. 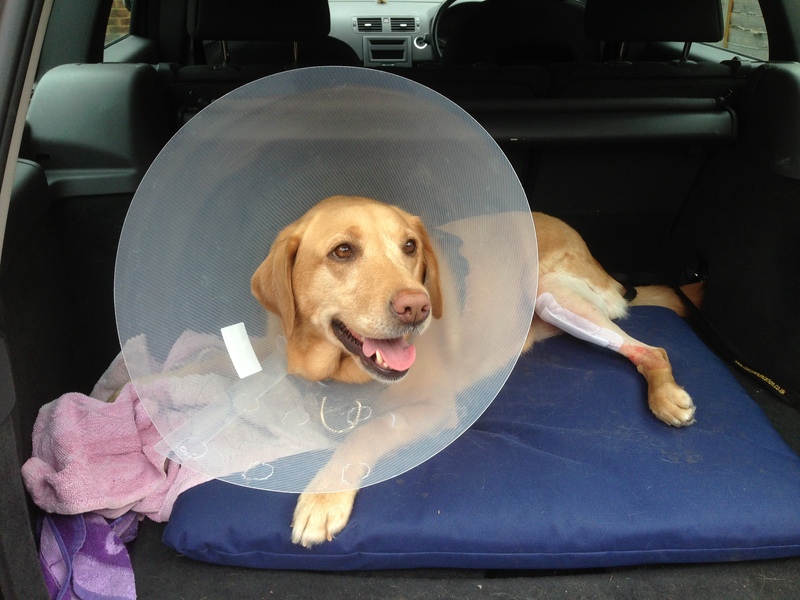 I’m still grateful to Fitzpatrick Referrals for the work they did to help Annie. There are many vets out there who could learn a thing or two about putting their canine patients first, but the fact that Annie was put through two anaesthetics in two days due to such a basic blunder makes my blood boil. The good news is that she’s making a great recovery and as the picture above shows, she seems very happy to finally be rid of the plate that once held her together. Here’s hoping that we can now, finally draw a line under the Annie’s leg saga.